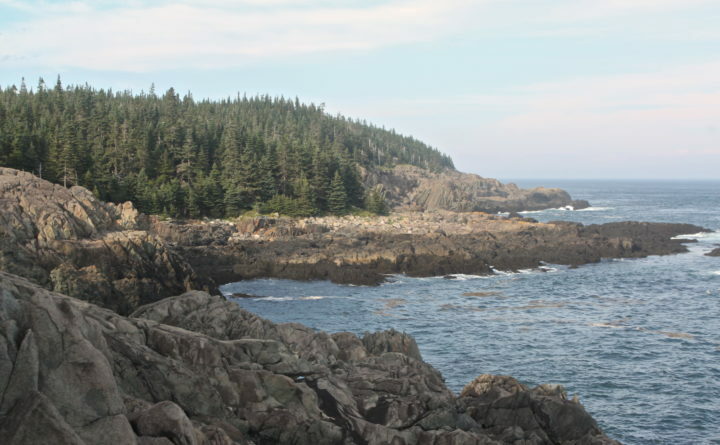 The rugged Bold Coast can be viewed from many spots along the coastal trail in Cutler Coast Public Reserved Land in this 2013 file photo. Maine game wardens on Sunday rescued two hikers who became stranded on a Down East hiking trail. Staci McCarthy, 53, and Margaret Ross, 73, both of Pembroke, went for a hike with their two dogs on the Bold Coast Trail in Cutler about 2 p.m., according to Mark Latti of the Maine Warden Service. After three miles, the women realized they underestimated the length and difficulty of the trail and that they wouldn’t make it back to their vehicle, parked on Route 191, before sundown, Latti said. The women didn’t have food, water or flashlights. McCarthy, who had her cellphone, called 911, and game wardens were able to determine their location before McCarthy’s battery died, Latti said. Game wardens and marine patrol officers attempted to rescue the two by boat but were prevented from doing so by a strong tidal surf, Latti said. Instead, game wardens, marine patrol officers, Cutler fire volunteers and Washington County sheriff’s deputies hiked five hours to the women’s location and helped them back over the icy trail, Latti said. They returned to their parked vehicle on Route 191 about 2 a.m. Monday, he said.